This 4 Bedroom pool home offers gorgeous views of Sarasota Bay, from vibrant Downtown Sarasota up to cozy Longboat Key. The master bedrooms is upstairs and has sliding glass doors to a large balcony overlooking the Bay. The other 3 bedrooms are downstairs, one of those has sliding glass doors that open to the pool deck. All living areas as well as the kitchen have beautiful views of the Bay as well. The living room has a huge sectional and offers a 70 inch HDTV. HDTVs in all bedrooms. Relax by the huge pool and enjoy watching the birds. You will experience the most beautiful sunsets you have ever seen from the private viewing dock! The home is equipped with a soccer table, airhockey table and kayaks. The home is located only 15 minutes to Florida´s most beautiful beaches and only 5 minutes to IMG Academy.! Free FIOS high speed internet access included. Electric pool heat / Spa is optional at an additional charge ($190 for the first week and $20 for each additional night). Rates are valid for up to 6 guests, additional guests will be charged $10/night. Maximum occupancy: 10 guests. 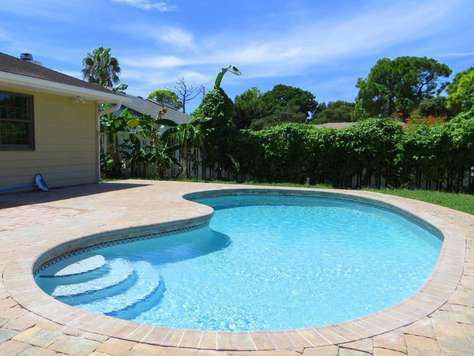 This Stylish Lakefront Pool Home is located on a quiet cul de sac in Northwest Bradenton. Relax in the sparkling pool or on the balcony! The modern kitchen is beautifully designed with stainless steel refrigerator, stainless dishwasher, stainless glass cooktop / range and stainless microwave and granite counters. The 2 story home offers 3 bedrooms, one of them a spacious master suite. All baths have recently been updated. The backyard is fenced to the neighbors and offers great privacy and plenty of room for your family. Located just a few miles from the beautiful beaches on Anna Maria Island and a quick bike ride to Robinson's Preserve. Free wireless internet is included. Free Netflix. This exceptional Lakefront Pool Home is located in a small and quaint community in Northwest Bradenton. 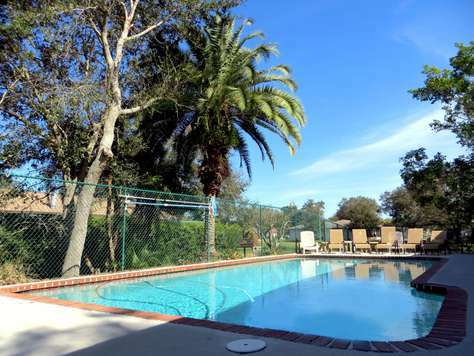 Sit on the freshly remodeled pool deck, relax in the sparkling heated pool and enjoy the views of the lake! The modern kitchen is beautifully designed with stainless side-by-side refrigerator, stainless dishwasher, stainless glass cooktop / range and stainless microwave and granite counters. The large living areas with vaulted ceilings and illumination skylights opens up to a bright and shiny Florida room, both rooms offering beautiful water views. The home has a split plan with a spacious master suite. The master bedroom has a king bed, the second bedroom has a queen bed and the third bedroom has 2 twins. 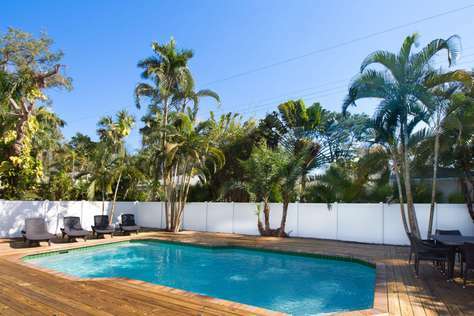 This beautiful modern vacation home is located in a quiet neighborhood in West Bradenton, only a short drive to Florida´s most beautiful beaches on Anna Maria Island. The master has a king bed, the second bedroom a queen and the third bedroom two twins. There is a big HGTV in the living room and two more TVs in the bedrooms. Enjoy the outdoor living on the large screened pool deck or in the fully fenced backyard. Convenient to all beaches, attractions, shopping, restaurants, museums, recreational activities, airports, and easy access to I-75 and US41. Only 10 minutes to IMG Academy. Free wireless high speed internet access! This beachy and modern 3 BR / 3 BA vacation home is located in a quiet neighborhood in West Bradenton, close to Downtown and only a short drive to Florida´s most beautiful beaches on Anna Maria Island. Enjoy the outdoor living on the large pool deck or relax in the huge sparkling pool. There are two master suites with king beds, the third bedroom has two twins. There is a big HGTV in the living room and two more TVs in the bedrooms. Convenient to all beaches, attractions, shopping, restaurants, museums, recreational activities, airports, and easy access to I-75 and US41. Only 15 minutes to IMG Academy. This beautiful completely remodeled vacation home is located in a quiet neighborhood in West Bradenton, only a short drive to Florida´s most beautiful beaches on Anna Maria Island. The master has a king bed, the second and third bedrooms have queen beds. The spacious kitchen offers stainless steel appliances and beautiful granite counters. 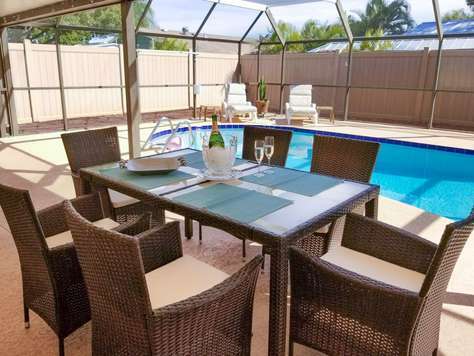 Enjoy the outdoor living in the fully fenced backyard and the sparkling pool. A full size washer and dryer complete this lovely accommodation. Free wireless high-speed internet access! 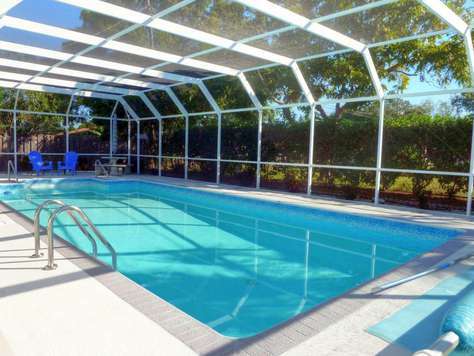 Why stay in a condo when you can enjoy the comforts and privacy of a tropical pool home!!! This charming 3 bedroom home is located in West Bradenton, only a short drive to Florida´s most beautiful beaches on Anna Maria Island. If you are looking for a private spot to spend your next vacation, this is the place to stay! Flatscreen HDTV in living room, one bedroom also has a HDTV. Master bedroom has a king size bed, 2nd and 3rd bedroom have 2 twins. Dining area has sliding glass doors that open to a large sreened in lanai with an oversized pool. Backyard is completely fenced in for ample privacy. A one car garage with washer (frontloader) & dryer complete this lovely accommodation. 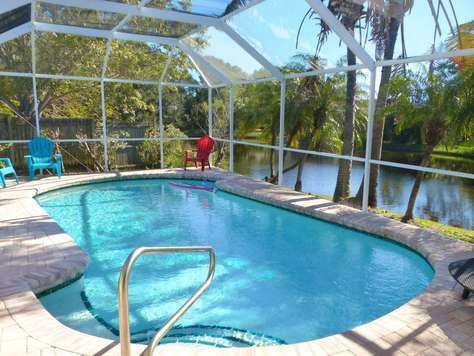 Cozy Pool Home in West Bradenton. Are you looking for a quiet and peaceful place for your next vacation? Then this home is the place to be! This charming 3 bedroom / 2 bathroom home is located in West Bradenton, only a short drive to Florida´s most beautiful beaches on Anna Maria Island and 10 minutes to IMG Academy. Master bedroom has a king size bed, 2nd bedroom has a queen and the 3rd bedroom has a twin bed. 2 bedrooms have TVs. The living area has sliding glass doors that open to the beautiful backyard with a large pool. Enjoy the outdoor living on the large screened pool deck or in the fully fenced backyard with beautiful irrigated green grass. Convenient to all beaches, attractions, shopping, restaurants, museums, recreational activities, airports, and easy access to I-75 and US41. Tropical vacation home, completely remodeled and fully furnished with high end furniture, 3 bedrooms, 2 baths, only 10 minutes to Anna Maria Island. Are you looking for a cozy and peaceful place for your next vacation? Then this home is the place to be! This beautiful home is located in a quiet residential area in West Bradenton and features a large private backyard with lounge chairs and a BBQ - overlooking the lush Florida landscaping and a pond. A large heated pool completes this lovely backyard. The spacious modern kitchen is beautifully designed with upscale fixtures and appliances including stainless side-by-side refrigerator with ice and water dispenser, stainless dishwasher, stainless glass cooktop / range and stainless microwave and granite counters. The home has two separate living areas, each with its own HD TV. The master bedroom has a king bed, the other two bedrooms have queen beds, all bedrooms have HD TVs as well. Maximum occupancy: 6 guests. Minimum stay is 3 nights or more depending on season, no exceptions. Tranquil vacation home, overlooking a pond, 4 bedrooms, 3 baths, only 10 minutes to Anna Maria Island. Your vacation begins when you enter this relaxing vacation home! This beautiful rental is located in a quiet residential area in West Bradenton and features a private backyard with lounge chairs and a Tiki Bar with Gas BBQ. Relax by the pool, enjoy a drink and watch the birds. The master bedroom has a king bed, the other three bedrooms have queen beds. A large heated salt water pool completes this lovely property. 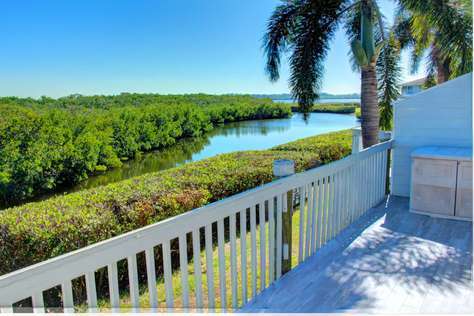 You and your guests are sure to find a way to enjoy the beautiful Bradenton weather while staying at this Florida vacation home. 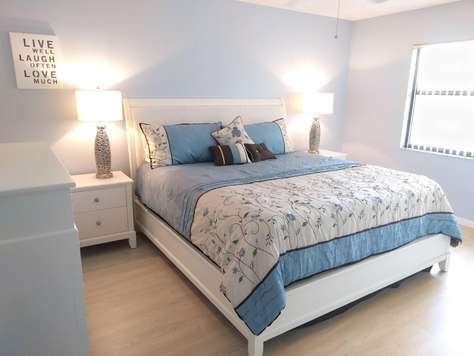 Modern 3 bedroom / 2 bathroom vacation home, completely remodeled and fully furnished with beautiful furniture, only 10 minutes to Anna Maria Island. This lovely pool home is located in a quiet residential area in West Bradenton and features a large private backyard with lounge chairs and a BBQ. The living area has french doors that open up to the covered outside patio. The separate dining room offers wonderful gathering space for family dinners. The spacious modern kitchen is beautifully designed with upscale fixtures and appliances including a stainless refrigerator with ice and water dispenser, stainless dishwasher, stainless glass cooktop / range and granite counters. The master bedroom has a king bed, the other two bedrooms have queen beds. Adorable 2 Bedroom, 2 Bathroom condo in resort style community! Sit on your back porch and enjoy the relaxing view over the pond. This beautifully furnished unit has tiles in the living area and carpet in both bedrooms. The spacious master bedroom has a king size bed, the second bedroom has a queen. Washer and dryer are in the unit. Convenient to all beaches, attractions, shopping, restaurants, museums, recreational activities, airports, and easy access to I-75 and US41. Only 5 minutes to IMG Academy. 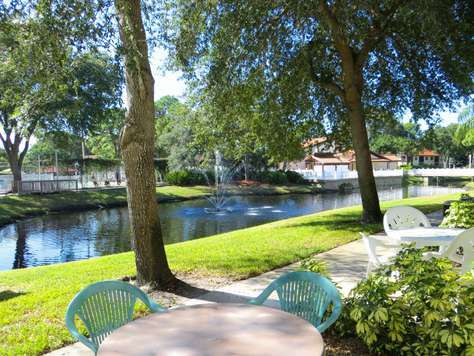 Lovely 2 Bedroom, 2 Bathroom ground floor unit in resort style community overlooking pond! The unit has tiles in living area and bathrooms and laminate floor in bedrooms. The master bedroom has a queen bed, the second bedroom has two twins. Washer and dryer are in the unit. Tucked away in the prestigious gated community of Perico Bay Club, this charming condo offers the comfort of a home away from home. Enjoy the beautiful and peaceful surroundings of Mangrove wetlands from the open deck. 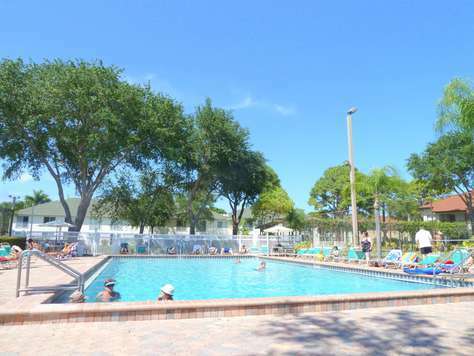 This Bradenton vacation rental offers 2 bedrooms and 2 bathrooms, one bedroom equipped with a king, the other one with 2 twin beds, both featuring walk in closets. Perico Bay Club is a a true tropical paradise and offers fabulous amenities, including a heated pool/spa, tennis courts, shuffleboard, exercise facility, clubhouses with a lending library, a fishing pier and lagoon boardwalk trails perfect for nature watching. The unit is just minutes away from the white sandy gulf beaches and located across the street from Robinson Nature Preserve which includes walking, biking and jogging paths. Application required, needs to be submitted 2 weeks prior to arrival. Additional application fees may apply if rental is for more than one couple or for international guests, please contact us with any questions.